UPDATE: I was pointed out a problem with original post due to look ahead bias introduced by prices > SMA(prices,100) statement. In the calendar strategy logic I did not use a usual lag of one day because important days are known before hand. 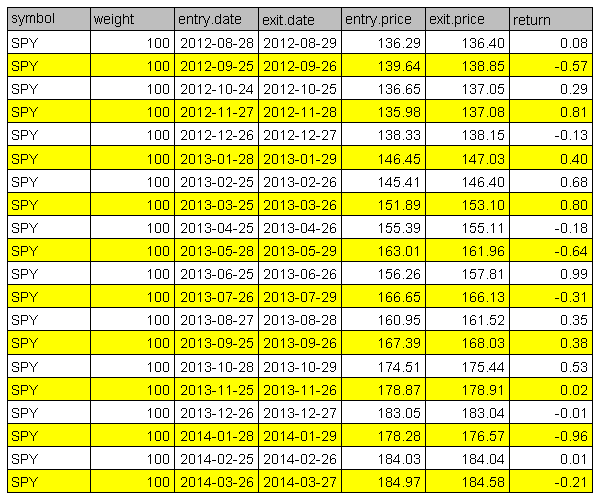 However, the prices > SMA(prices,100) statement should be lagged by one day. I updated plots and source code. 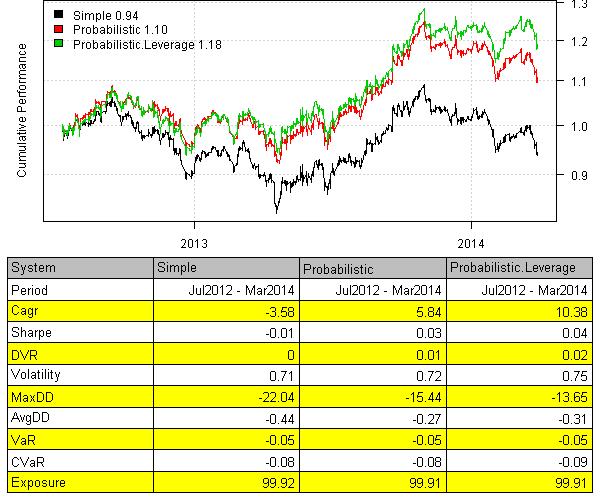 Today, I want to follow up with the Calendar Strategy: Option Expiry post. 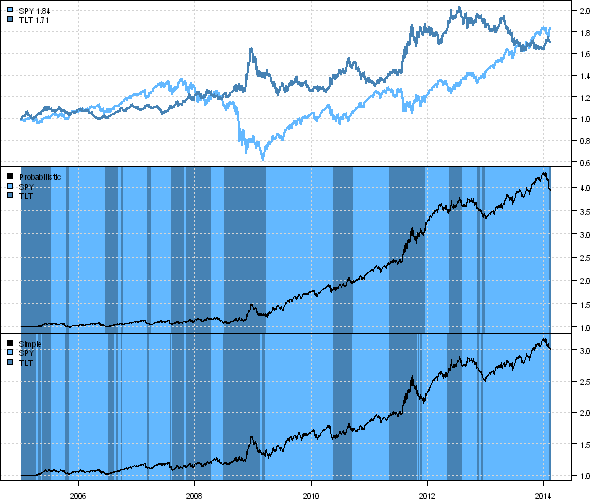 Let’s examine the importance of the FED meeting days as presented in the Fed Days And Intermediate-Term Highs post. Please note 100 day moving average filter above. If we take it out, the performance deteriorates significantly. Next, I will look at the importance of the Dividend days. To view the complete source code for this example, please have a look at the bt.calendar.strategy.fed.days.test() function in bt.test.r at github. Today, I want to follow up with the Calendar Strategy: Month End post. 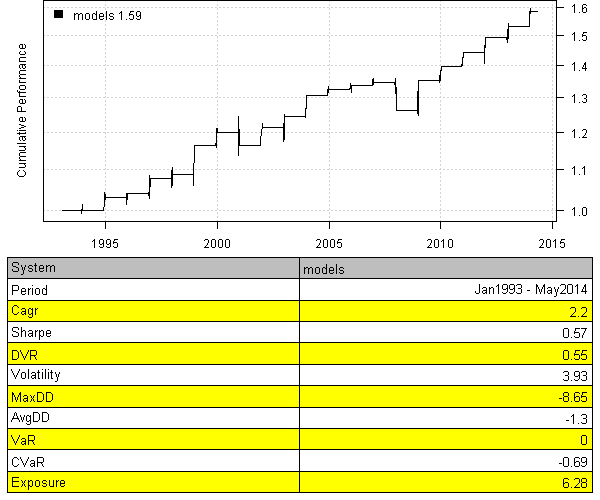 Let’s examine the perfromance Option Expiry days as presented in the The Mooost Wonderful Tiiiiiiime of the Yearrrrrrrrr! post. 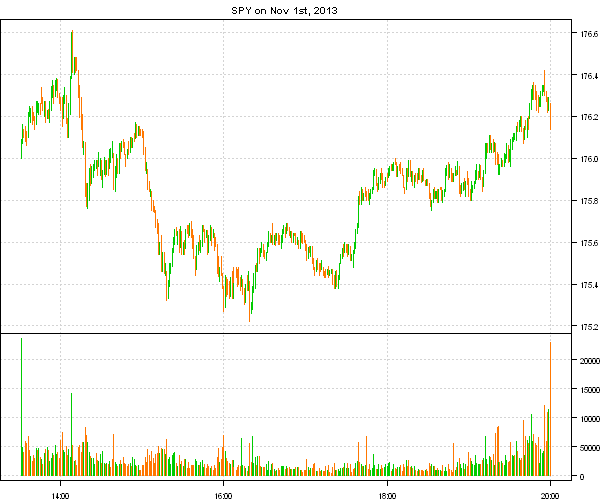 #   Buy: December Friday prior to op-ex. Next, I will look at the importance of the FED meeting days. bt.calendar.strategy.option.expiry.test() function in bt.test.r at github. 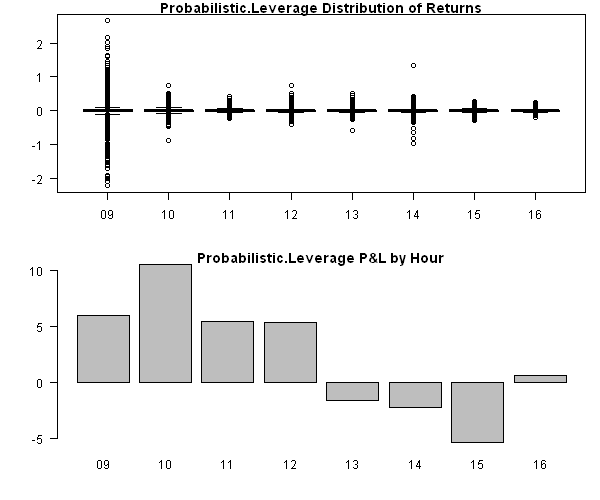 I want to follow up the Intraday data post with testing the Probabilistic Momentum strategy on Intraday data. 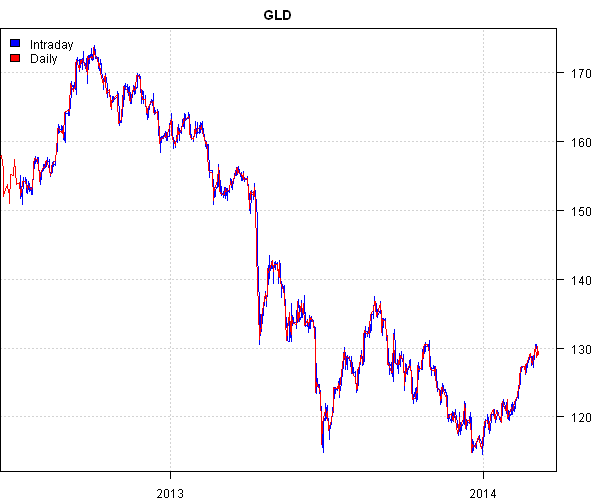 I will use Intraday data for SPY and GLD from the Bonnot Gang to test the strategy. 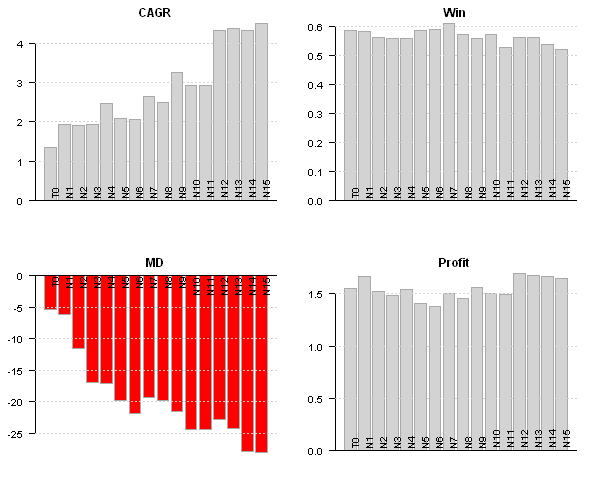 Next, let’s examine the hourly perfromance of the strategy. 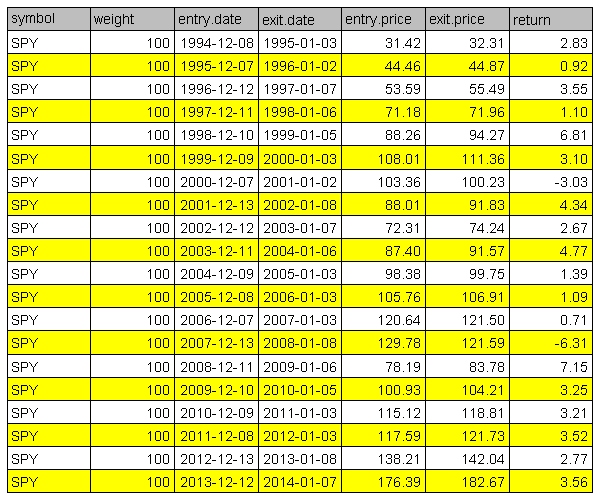 There are lots of abnormal returns in the 9:30-10:00am box due to big overnight returns. I.e. a return from today’s open to prior’s day close. If we exclude this observation every day, the distribution each hour is more consistent. The strategy performs best in the morning and dwindles down in the afternoon and overnight. 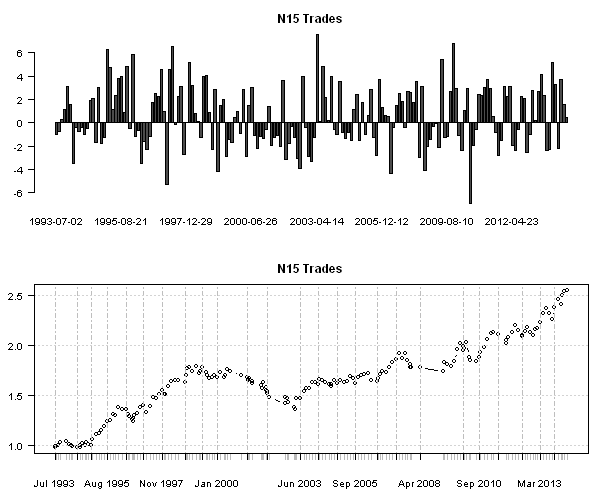 These hourly seasonality plots are just a different way to analyze performance of the strategy based on Intraday data. To view the complete source code for this example, please have a look at the bt.strategy.intraday.thebonnotgang.test() function in bt.test.r at github. 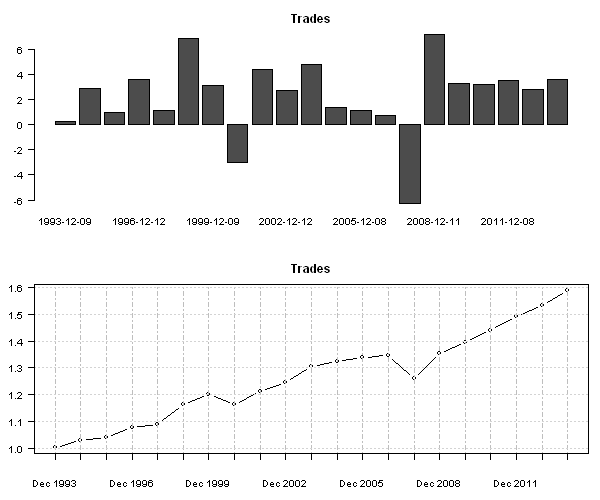 In the Intraday Backtest post I showed an example of loading and working with Forex Intraday data from the FXHISTORICALDATA.COM. Recently, I came across another interesting source of Intraday data at the Bonnot Gang site. Please note that you will have to register to get access to the Intraday data; the registration is free. 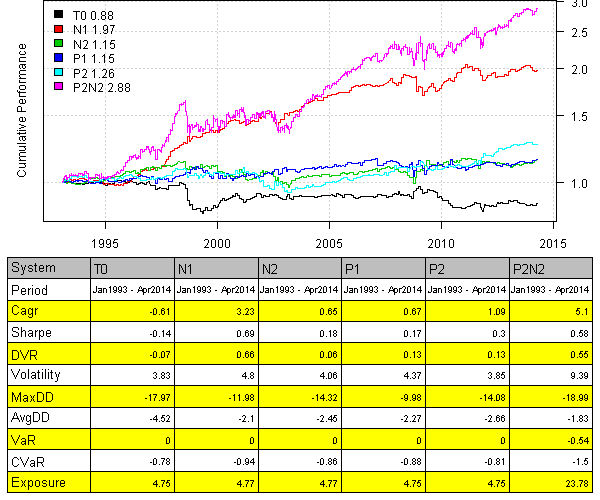 Today, I want examine quality of the Intraday data from the Bonnot Gang and show how it can be integrated into Backtest using the Systematic Investor Toolbox. 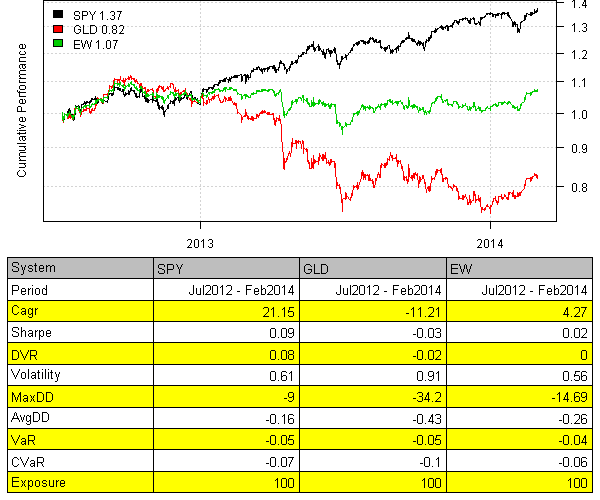 For the example below, please first download and save 1 minute Intraday historical data for SPX and GLD. Next let’s load and plot time series for SPX. 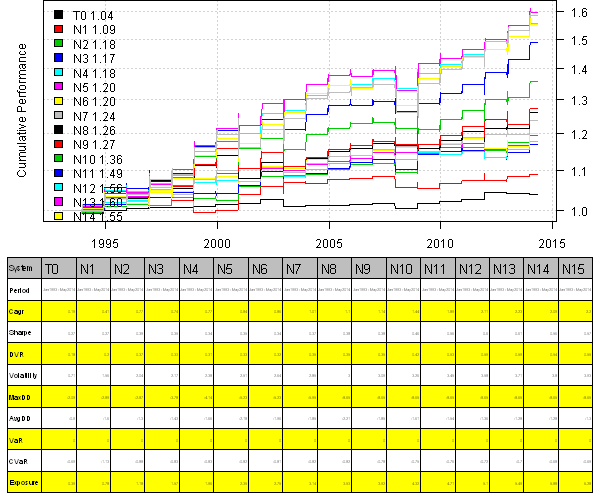 It jumps right away that the data provider had changed the time scale, in 2012 data was recorded from 9:30 to 16:00 and in 2013 data was recorded from 13:30 to 20:00. Next, let’s check if there are any big gaps in the series Intraday. So there is definitely something going on with data acquisition at that time. 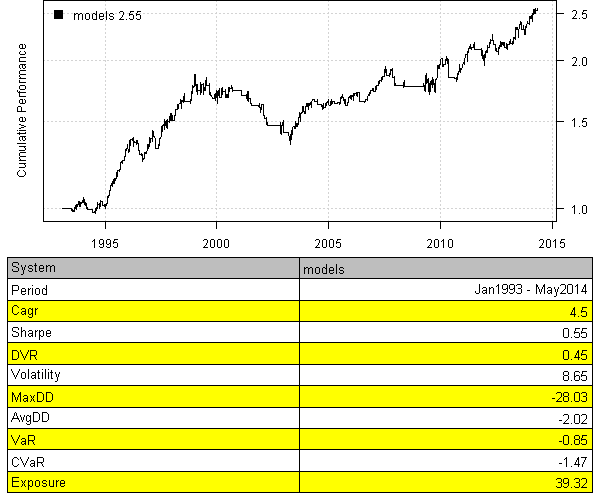 The Intraday data matches Daily data very well. 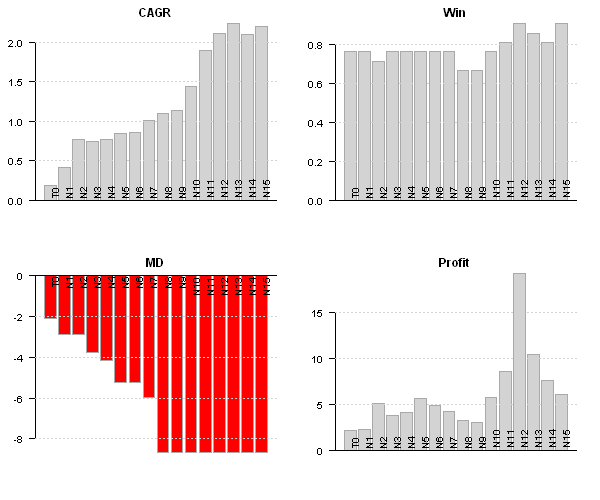 I got an impression that these Intraday data is not really authentic, but was collected by running Intraday snap shoots of the quotes and later on processed to create one minute bars. But I might be wrong. In this post, I tried to outline the basic steps you need to take if you are planning to work with a new data source. 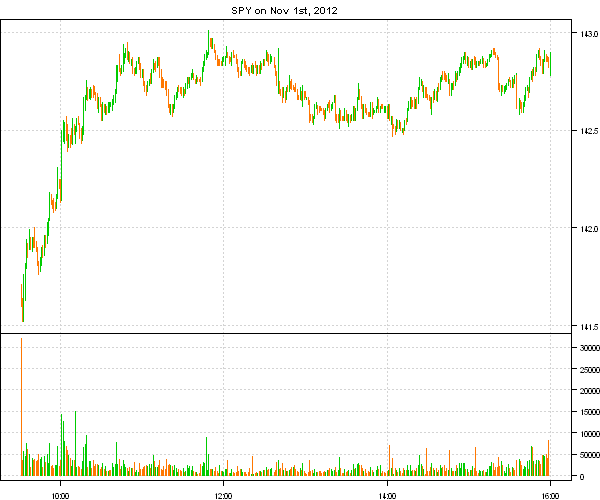 Next, I plan to follow with more examples of testing Intraday strategies. To view the complete source code for this example, please have a look at the bt.intraday.thebonnotgang.test() function in bt.test.r at github. 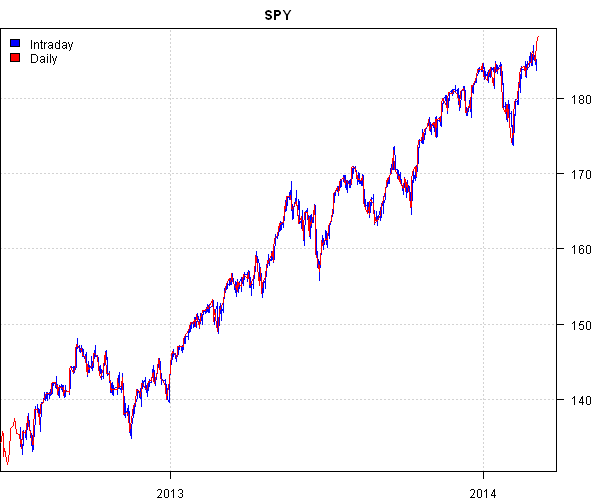 The Simple Momentum strategy invests into SPY if SPY’s momentum if greater than TLT’s momentum, and invests into TLT otherwise. 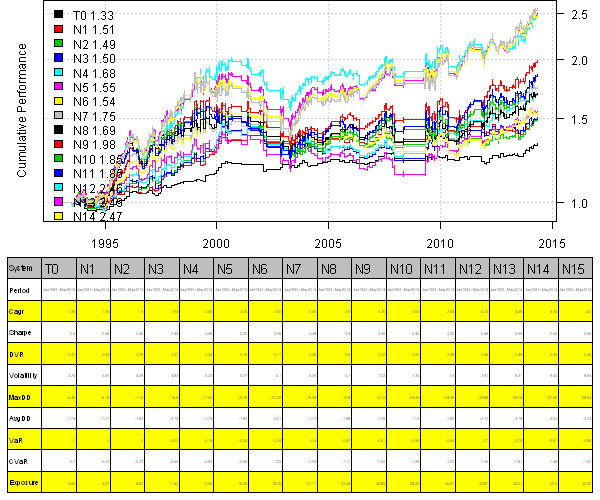 The Probabilistic Momentum strategy is using Probabilistic Momentum measure and Confidence Level to decide on allocation. 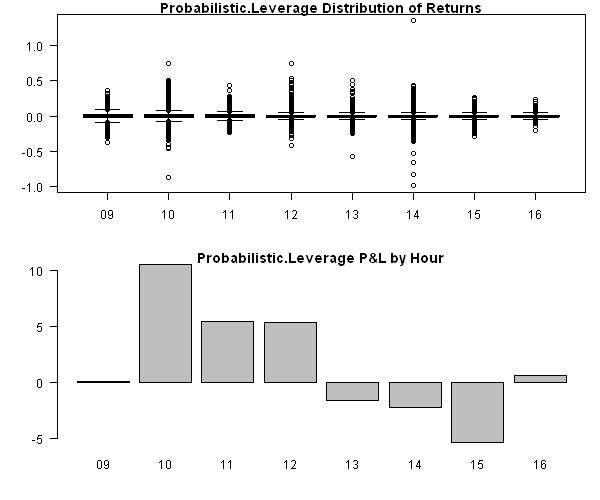 Strategy invests into SPY if SPY vs TLT Probabilistic Momentum is above Confidence Level and invests into TLT is SPY vs TLT Probabilistic Momentum is below 1 – Confidence Level. 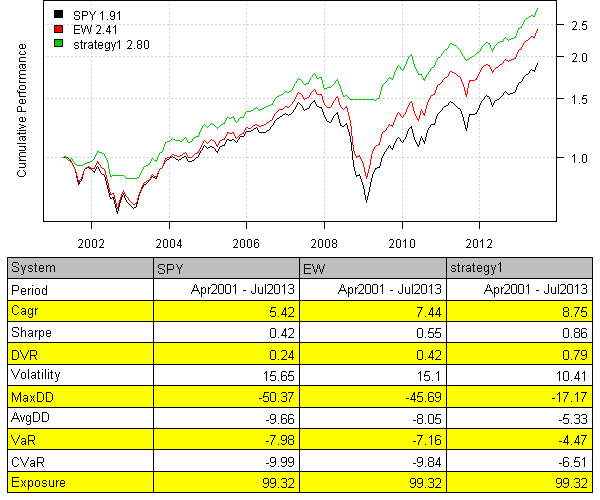 The back-test results look very similar to the ones reported in the Are Simple Momentum Strategies Too Dumb? 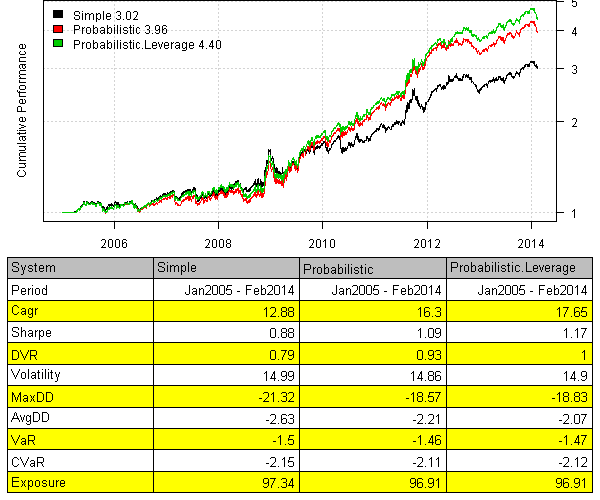 Introducing Probabilistic Momentum post. 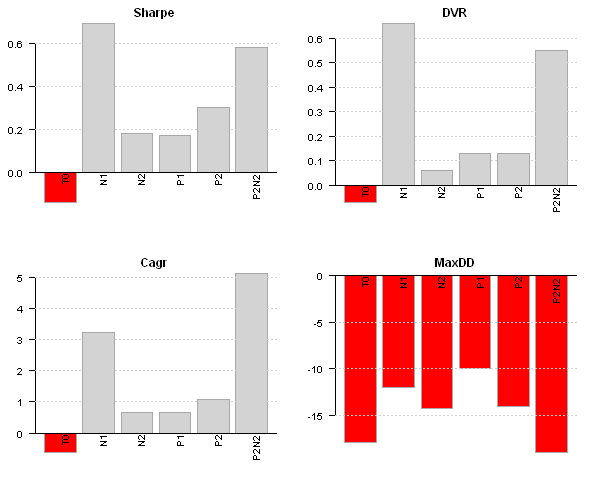 However, I was not able to exactly reproduce the transition plots. Looks like my interpretation is producing more whipsaw when desired. David thank you very much for sharing your great ideas. I would encourage readers to play with this strategy and report back. To view the complete source code for this example, please have a look at the bt.probabilistic.momentum.test() function in bt.test.r at github. Mebane thank you very much for sharing your great ideas. I would encourage readers to play with this strategy and report back. 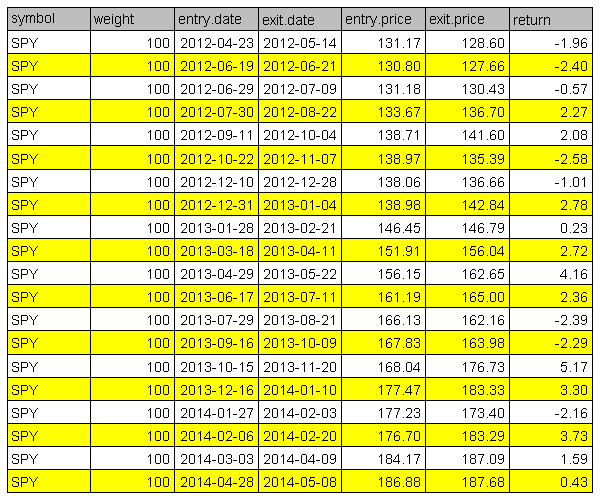 Please note that I back-tested the strategy using the monthly observations. The strategy’s draw-down is around 17% using monthly data. If we switch to the daily data, the strategy’s draw-down goes to around 22%. There was one really bad month in 2002. To view the complete source code for this example, please have a look at the bt.mebanefaber.f.squared.test() function in bt.test.r at github.